Whether you are an art collector, need artwork for your home or office or merely wish to support the arts, join us in downtown Sarasota on January 16-17, 2016 for the 5th . Thanks to your gracious support of the arts and artists, this event has become one if not the most powerful and successful art festival in Florida and one of the nation's top ranked art events. Gulfstream Ave. will blossom into an extraordinary outdoor gallery of original handmade fine art created from spectacular creations in painting, sculpting, jewelry, photography, glass, ceramics – and more. Commission a unique piece of art made specifically for you! The creators of the work will be available throughout the show. 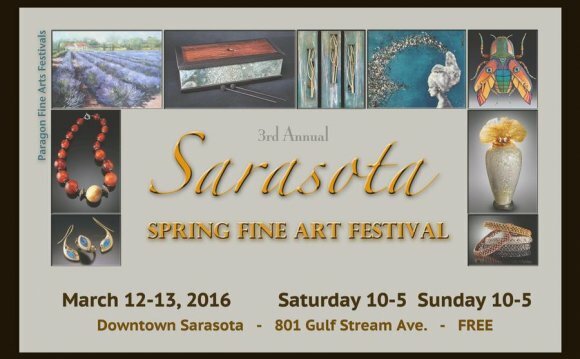 The 5th Annual Sarasota Winter Fine Art Festival is open 10:00 am to 5:00 pm both Saturday and Sunday. Admission and parking are free. Bring your sense of discovery and appreciation of the beautiful! Wallets and purses are recommended as all artwork is for sale! The HSSC will have their “Big Mac” mobile adoption center onsite. Come by to say “hi” to the staff and meet their extended family of friends awaiting adoption. Find a new companion and lend support to a wonderful and compassionate organization.